Not by nature but by your unusual life. Our Venerable and God-bearing Father Paisios the Great was from the village of Shansa in Egypt and born in 320. His parents were Christians, that distributed generous alms to all the needy. Younger to six other brothers, he was weak and frail. After the death of her husband, his mother saw an angel in a vision saying to her: "The Lord says to you, give Me one of your children to serve Me." She answered: "Lord, take whoever you want." The angel took the hand of Paisios, who was thin and his body was frail. His mother told the angel, "My Lord, take one who is strong to serve the Lord." "This is whom the Lord has chosen," the angel replied. At the age of twenty, Paisios went to the wilderness of Scetes and became a monk by the hand of Saint Pambo, who also ordained Abba John the Dwarf, the future biographer of Saint Paisios. Renouncing his will, Paisios lived under the spiritual guidance of Abba Pambo, finishing all the tasks assigned him with humility and obedience. The Elder said that a new monk in particular needs to preserve his sight, in order to guard his senses from temptation. Paisios, heeding the instruction, went for three years with his eyes cast downwards. He also came to understand the great value of fasting for the spiritual life. At first he did not eat any food for a week, then two weeks. Sometimes, after partaking of the Holy Mysteries of Christ, he survived without food for seventy days. 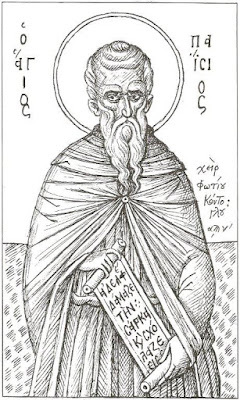 When Abba Pambo died, Paisios went into the Nitrian desert in search of solitude. There he lived in a cave carved out by his own hands. 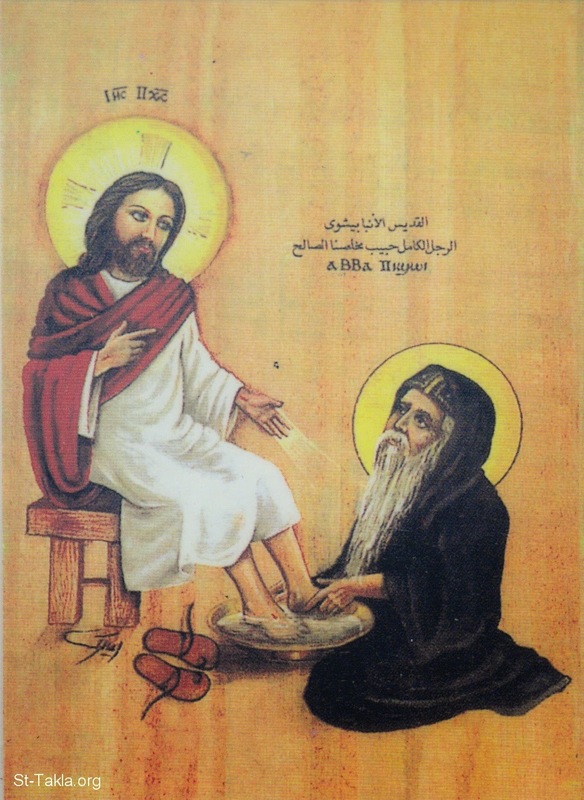 The Saint was granted a wondrous vision: the Lord Jesus Christ revealed to him that through his labors the Nitrian wilderness would become inhabited by ascetics. He asked the Lord where the monks would obtain the necessities of life in the desert. The Lord said that if they would fulfill all His commandments, He Himself would provide all their necessities, and would deliver them from demonic temptations and cunning. Paisios was guided by an angel to the site of the present Monastery of Saint Pishoy (Paisios), where he lived the life of a hermit. At this time, he became the spiritual father of many monks who gathered around him. He was famous for his love, wisdom, simplicity and kindness, as well as for his extremely ascetic life. He was also known to love seclusion and quietness. Paisios's asceticism was harsh to the extent of tying his hair and hands with a rope to the ceiling of his cell, in order to resist sleeping during his night prayers. This asceticism made him so famous that he was visited by Saint Ephraim the Syrian. In time a monastery was established. The most important rule of Abba Paisios was that no one would do anything by his own will, but in all things would fulfill the will of his elders. It is believed Paisios saw the Lord Jesus a number of times. Once, an old monk asked him to help him climb a mountain, so Paisios carried him on his shoulders and climbed, only to discover that the old monk was no one but the Lord Himself. The latter told him that, for the extent of his love, his body will not see corruption. Saint Paisios was also said to have seen Jesus at his monastery. When Paisios's brethren learned that Jesus was coming, they gathered so that they might see Him. Earlier, there had been an old man that asked these monks to help him on his way but they ignored him. 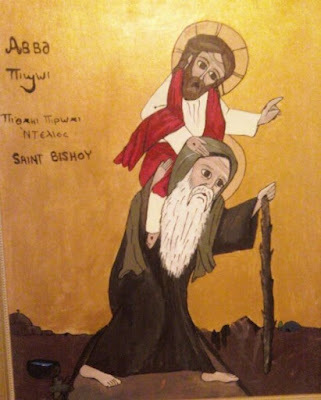 When Saint Paisios saw the old man, he helped him back to his room. He customarily washed the old mans feet. The old man then appeared to him as our Lord Jesus. The Emperor Constantine and the Prophet Jeremiah appeared to him in visions. In one of those visions the Emperor Constantine said: "Had I known how great is the honor of monks, I would have abandoned my kingdom and became a monk." Paisios told him: "You have banished the heathen worship and exalted Christianity, and has not Christ given you anything?" Emperor Constantine answered him: "The Lord has given me many gifts, but none of them is like the honor of the monks." 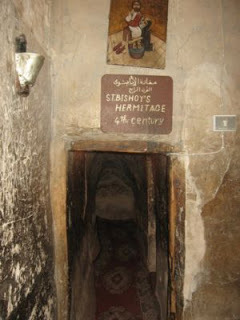 Since his tranquility was being disturbed by so many people, the Saint withdrew to another cave farther away. Once, he was transported to a paradisaical monastery and partook of the immaterial divine food. After his ascetic labors for salvation, the Lord granted His Saint the gift of foreknowledge and healing the souls of men. One of his disciples, with the Saint’s blessing, went to sell his handicrafts in Egypt. On the way he encountered a Jew, who told the simple-minded monk that Christ the Savior is not the Messiah, and that another Messiah will come. Confused, the monk said, “Maybe what you say is true,” but he did not attribute any particular significance to his words. When he returned, he saw that Abba Paisios would not acknowledge his arrival, and he asked the reason for his anger. The Saint said, “My disciple was a Christian. You are not a Christian, for the grace of Baptism has departed from you.” The monk repented with tears, and begged to have his sin forgiven. Only then did the holy Elder pray and ask the Lord to forgive the monk. 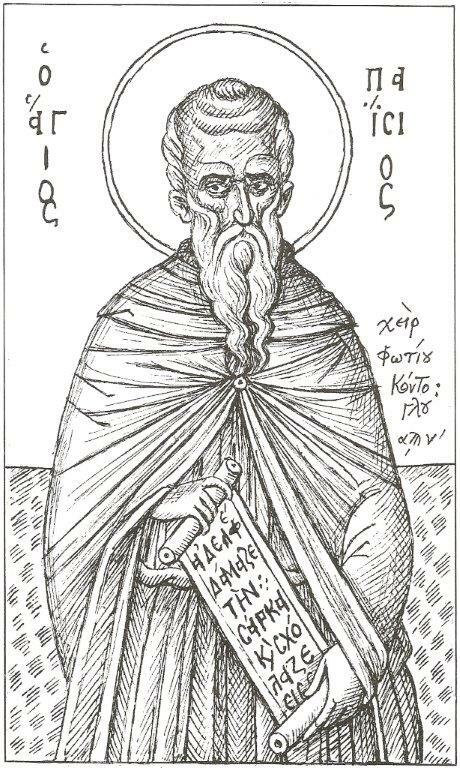 Paisios is known as a defender of Orthodoxy against heresies. Having heard of an ascetic in the mountain of Ansena who taught that there was no Holy Spirit, Paisios went to him carrying a weaved basket with three ears. When the old man asked him about the reason for making three ears for a basket, Paisios replied: "I have a Trinity, and everything I do is like the Trinity." After much debate from the Scriptures, the Old and New Testaments, the old ascetic reverted to Orthodoxy. A certain monk on his own initiative left the desert and moved near a city. There he had encounters with a woman, who hated and blasphemed Christ the Savior. Under her influence, he not only left the monastery, but also scorned faith in Christ, and finally he reached a state of total disbelief. Once, through the blessed Providence of God, Nitrian monks came by his cell. 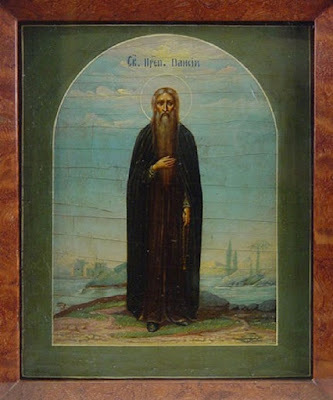 Seeing them, the sinner remembered his own former life and he asked the monks to ask Saint Paisios to pray for him to the Lord. On hearing the request, the Saint prayed fervently, and his prayer was heard. The Lord, appearing to His Saint, promised to forgive the sinner. Soon the seduced monk’s woman companion died, and he returned to the desert where, weeping and distressed for his sins, he began to labor at deeds of repentance. In 407/408 AD, as the Berbers invaded the wilderness of Scetes, Paisios left and dwelt in the mountain of Ansena. At this time, he met Saint Paul of Tammah in Antinopolis and the two became very close friends. While at the mountain of Ansena, Paisios built another monastery, the Monastery of Saint Pishoy at Dayr al-Barsha, which still stands today near Mallawi. Paisios reposed in peace in 417, and he was buried by the monks. 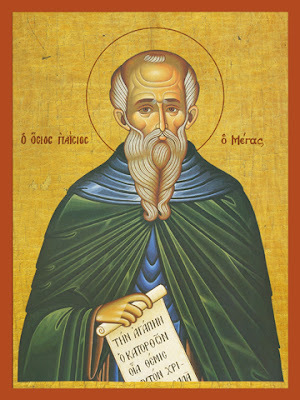 After some time his relics were transferred by Saint Isidore of Pelusium to his own monastery and placed beside the relics of his friend Saint Paul of Tammah. 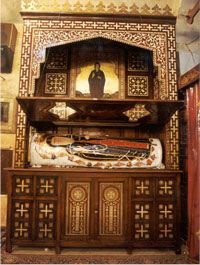 Today, the two bodies lie in the main church of the Coptic Monastery of Saint Pishoy in the Nitrian Desert. Eyewitnesses recount that the body of Saint Paisios remains in an incorruptible state to this day. There are currently three monasteries in Egypt that carry the name of Saint Pishoy: the Monastery of Saint Pishoy at the Nitrian Desert; the Monastery of Saint Pishoy at Deir el-Bersha, near Mallawi; the Monastery of Saint Pishoy at Armant, east of Armant. The sublime monk and incarnate angel, the bodiless man and citizen of heaven, grants grace to all who honour him, as today he celebrates with us. Let us fervently ascribe glory to him. Let us the faithful sing praises to divinely-wise Paisios, the desert's adornment, equal-to-the-Angels, Christ's friend and the glory of monks. Let us cry to him: Rejoice, O Father Paisios.